Please don’t put yourself at excessive risk to help a stray dog. You can’t help dogs in the future if you are injured, dead, or in jail. Examples of risky behavior dog rescuers sometimes engage in include: stopping in the middle of a busy freeway for a dog; trying to catch a dog showing obvious signs of fear and aggression, without using the proper equipment; going alone into unsafe neighborhoods or wild landscapes to catch a dog; trespassing on private property; and texting or using social media while driving. If you are a volunteer for UBS, please understand that if we ask for your help with a stray, we are never asking you to do anything that puts your personal health and safety at excessive risk. In most cases, there is an alternative method that will allow you to help that stray dog without risking personal injury. If you don’t know the best way to go about something, please ask before proceeding. When helping a stray dog, you will usually find yourself teaming up with people you just met. Strangers banding together to help a stray dog is great, but these newly-formed, spontaneous working groups can have problems when people disagree on the goal or methods. Whenever possible, write down or record contact information for everyone involved with the capture of a dog. Try to assign tasks that match a person’s abilities and availability. Agree on avenues of communication that work for all members of the group. Some people like to receive texts or Facebook messages, while others need to be called or emailed. You may wish to establish a tiered communications tree, where a nexus of helpers receives information the fastest, easiest way, such as through texts or a dedicated Facebook page, and certain people are responsible for calling volunteers who aren’t able to access those main communication channels. If you are hoping that this particular stray dog will benefit from the resources and experience of UBS, it is important to talk to a board member or key coordinator to make sure UBS has the capacity, such as donations, fosters, and other resources, to take on this dog in need. From time to time, UBS will have to decline to help some dogs because we are temporarily at the capacity of our current volunteer base and our donor base. Please call 206-552-0304 if you know of a dog that could benefit from the assistance of UBS, or email UselessBaySanctuary@gmail.com. UBS is an all-volunteer organization, and we can only make suggestions about what you should do regarding stray dogs if you are acting on your own. If you are acting as a UBS volunteer, or helping with a dog sponsored by UBS, then we do expect our volunteers to adhere to certain standards. With every stray dog case, one person should be the key contact for that mission. In emergency response training, this is usually called the Incident Commander. This Incident Commander does not necessarily need to be an expert in all aspects of helping a stray dog. The important thing is that the IC takes responsibility for coordinating the rescue effort, assigning tasks, keeping record of communications, and getting advice from experts and authorities when needed. Other people helping out with the rescue need to respond to the IC, saying clearly, I will do this task, or I’m not able to do this task. Miscommunication and a lack of cooperation can and has resulted in the failure to help a stray. People who are passionate about helping animals aren’t always going to agree on what is best. Useless Bay Sanctuary has experience and expertise in this field, and UBS volunteers are expected to follow that guidance even when it goes against their instincts or past experiences. Keep in mind that most wandering dogs are close to home. UBS, as an organization, has been helping strays for over 2.5 years, rescuing about 100 dogs a year. Of those dogs, more than half were wandering within a few blocks of their home, and they were reunited in less than 30 minutes. If you see a wandering dog, don’t automatically jump to the conclusion that the dog is far from home or that the dog is even lost. Many people, against common sense, simply allow their dogs to wander. 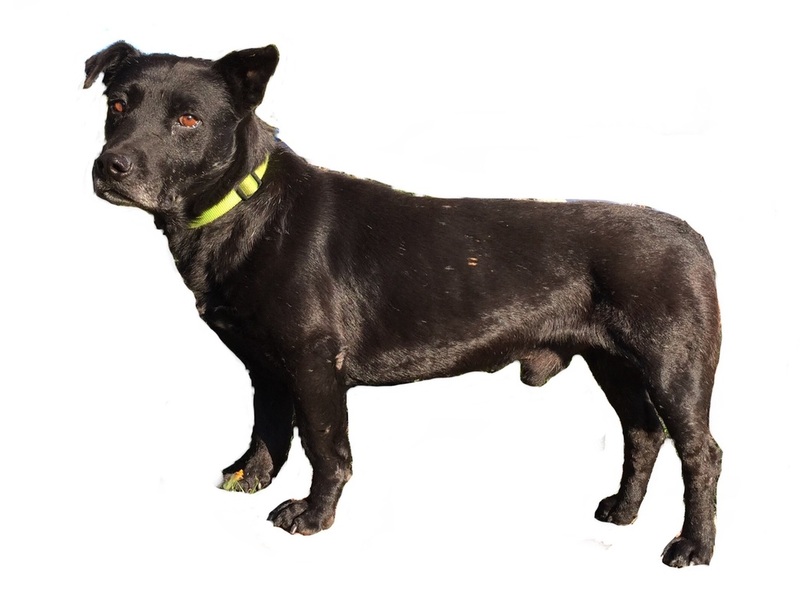 Please check the area where you first saw the dog, and see if anyone in the area knows the dog. Less than half of the strays you see will need to be transported to a shelter or a foster home. Try capture techniques in order, starting with methods that won’t spook the dog. When you first see a stray, you have to make some decisions about the best way to help that dog. As an example, one method is to use the Snappy Snare. I don’t usually start with this. I would try calming signals first in most cases, and probably a humane trap. The Snappy Snare is a great tool in certain situations, but it’s not always the easiest use. If you try it and fail, you can scare the dog away. You might cause the dog to bolt into traffic, or go into hiding and be very difficult to locate again. You should never start your capture attempt by chasing a dog or trying to corner a dog. These techniques almost never work, and they will make it harder to help the dog. I have, on rare occasions, caught a dog by chasing or by cornering, when other options had been tried or ruled out, or when the circumstances provided a brief opportunity where it would work. These methods are your last resorts, not your primary techniques. Is there anyone in the US who does not have a smartphone that takes pictures? If you are the last person to get one, please make the leap to modern technology for your love of animals. When helping a stray, pictures are a very important tool. Your attempt to capture the dog might fail, and having a picture of the dog can help subsequent rescuers locate the dog again and make a new capture attempt with other methods. For example, Viktor had been on the run for two weeks when Dina saw him in a vacant lot. She was not able to capture him that day, mostly because she was already late for work and didn’t have time to use calming signals. She did lure him within five feet, though, and got a few good pictures. These pictures were critical over the next few weeks as we followed Viktor for twenty miles from Everett to Seattle. Those pictures of Viktor helped us generate new leads through Facebook and posters. We eventually caught Viktor, and we might never have caught him without those pictures. When you see a stray, take a picture right away even if it is blurry and distant. As you get closer, you can take better pictures, but a blurry picture is better than no picture. You won’t know right away what is important information and what is irrelevant. Be sure to take notes about when and where you saw the dog, exact time and address if possible. Did you see another car in the area? 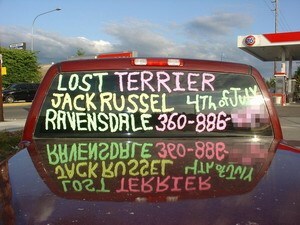 Quite often, people report seeing a vehicle in the area where they first saw a dog, and they assume the dog was dumped. While that is possible, it usually turns out not to be true. My theory is that it is usually another Good Samaritan who was trying to help the dog and gave up. Either way, make note of the car make, model, and license number if possible. I take notes on my iPhone, using an app called Evernote. You can also just jot it down on a piece of paper. If your attempts to catch a dog stretch on to days or weeks, which sometimes happens, then you will rely on those notes more and more. You will want to learn the patterns of behavior of the dog, and your notes are key. Don’t make decisions about what is important or not. Just make note of everything. If you talk to a neighbor, try to get a phone number in case you want to talk to them later. For the purposes of UBS, we want to know how many hours you worked on catching a dog. Volunteer organizations can use recorded volunteer hours to access grants or attract funding. If you use a smartphone wisely, it is simply and quick to make audio recordings on your phone, as a method of taking notes. Also, it may be very useful later if you can stand where you saw the dog and make a 360 degree video recording of the surroundings. These days, it is easy and cheap to capture and store information. It won’t take much of your time. Take lots of notes. When you first see a stray, after you have taken a picture and a few initial notes, take some time to observe the dog. Chances are, you will soon see that the owner is nearby, perhaps on the other side of the park or across the street, and you won’t need to take any of the steps for catching a stray. If it truly is a wandering dog with no owner in sight, then your observations of behavior are more critical. Does the dog appear to be on a mission, sniffing the landscape and following a scent trail? This is a sign that the dog lives nearby and is out on an adventure, authorized or not. Does the dog react with caution or alarm to noises or movements? That might indicate a truly lost dog. Does the dog move toward or away from people? Does he walk right up to them or stop at a certain distance? How does he carry his tail? Does he appear dirty, skinny, or matted? If a dog looks abandoned or dumped, you can’t really draw that conclusion based on appearance. My white poodle, Fozzie, is a dirt magnet, and he can look like a muddy stray just after talking a walk on a rainy day. My old dog Porter was very thin, toward the end of his life, even though he was offered all the food he could eat. If he got loose and someone found him as a stray, they might assume he was neglected or abused even though he was receiving constant veterinary care. So, observe the dog, but don’t fix in your mind what those observations mean. You may get new information that would change the situation. When you get out of the car and start to approach the dog, be aware of his reactions to you. Adjust your approach based on his behavior. Observing the dog is also crucial for avoiding a bite. I have been bitten at least eight times. In each case, I saw the bite coming. I could tell by the look in the dog’s eyes, the way his body tensed, and sometimes by a low growl, that a bite was coming. In most of those cases where I was bitten, I was willing to take the bite as long as I was able to get the dog to safety. Every dog that bit me was okay with me later, after being caught and having some time to settle down. I DO NOT recommend that you allow a dog to bite you if you see the bite coming. Back off and try another way. Being bitten is no fun, and potentially dangerous. Also, you don’t want a dog to have a bite on his record because you will have to disclose that, and it could make his future more difficult. Even though I have been bitten eight times, in hundreds of cases, when I sensed a bite coming, I modified my approach to avoid the bite. This may mean using a humane trap, or giving the dog some time to relax and adjust. If you are paying attention, you can almost always see a dog beginning to think about biting you. It almost never happens out of the blue without warning. When people say a dog gave no warning before biting, it probably means they weren’t paying attention to the clear signals the dog gave. Don’t walk directly toward a stray dog. Walk to the side, and bend your path closer and closer, in a tightening spiral. Don’t look directly into the eyes of a stray. If you do make eye contact, look down and to the side right away. In general, don’t look at the dog at all. Pretend you don’t even see her. Sit or lie on the ground. Don’t kneel, squat, or crouch. You want to communicate to the dog that you aren’t in a position to make any sudden movements. You are not a threat. Accidentally drop some food. If you toss food toward the dog, don’t use an overhand throw. Fling it under hand, and with an arc to the toss, as if you are throwing the food away, not throwing an object at the dog. If the dog comes close, try to get her to eat out of your hand. After a few times of that, you may be able to stroke her chin. DO NOT put your hand over her head to pet her on top of the head. Keep your hand where she can see it. Don’t make any sudden movements. Let her see the slip lead and get used to it. If you are using a snappy snare, that’s different; see the instructions below. Lick your lips and yawn frequently. Pretend to eat the food, even if it’s some sort of disgusting dog treat that you would never eat. If a dog lets you pet her, then you can be certain you will get her. Take your time, and let her get relaxed around you. No sudden movements. Practice with calming signals before you need to use them to catch a stray. When you meet a friend’s dog, use calming signals even if you don’t need to, and see how differently the dog reacts. Watch videos about calming signals. Kat Albrecht of Missing Pet Partnership has an excellent video on calming signals, which you can find by googling those keywords. Sometimes, catching a dog is as simple as opening your car door. Many lost dogs will just hop right into a car. It doesn’t work every time, but it doesn’t hurt anything to try it early in the capture effort. Usually, you would do this by pulling ahead of a dog that is trotting along the road and pulling over. Open the rear door if possible, or the door farthest from you. Just sit facing forward and don’t look at the dog. If she gets to the car door and hesitates, say, in a casual tone, “Let’s go for a ride.” You can toss a treat into the back seat as an added incentive. Some dogs roaming loose are more likely to come up to a friendly dog than to a person. If you have a friendly dog handy, you can walk near the stray dog, ignoring him, and see if he takes an interest in your dog. Give your dog some treats, and if the stray dog is at all interested in food, he is likely to come up to you to beg for treats. As with all capture techniques, you don’t want to make a sudden grab at the stray’s collar. Not catching a dog is better than spooking a dog into traffic or chasing him out of his comfort zone. If the stray wants to start playing with your dog, chances are you will have no trouble putting a leash on the stray eventually. If the stray is an intact male that wants to mate with your dog, he may be more of a hassle to deal with, but you have an excellent chance of getting a leash on him. I have also used a less-than-friendly dog a as a magnet dog in some circumstances. Kelsy is a great dog, and she is not unfriendly, but she can be bossy. Kelsy, a black Lab, successfully lured another black Lab when I played fetch with her in a parking lot. The other dog wanted to join in the game, even though Kelsy wasn’t polite. The magnet dog often works well with the snappy snare, discussed next. Another way you can use a snappy snare is to have it looped, but not under tension. If you have a small dog that is nippy but not fleeing, you can sometimes just gently pass the loop over his head and then pull back to tighten it. You can use the snappy snare with a magnet dog, or with treats on the ground. A snappy snare will not work if you are at the wrong angle, and the dog may get spooked and run away if you try the snappy snare and fail. I usually try other methods before the snappy snare. You can buy one online. Prices range from $30 to $80. I used to like the stainless steel model until it started to fray. Now it gives me little metal slivers. Viktor escaped from a rescue group and roamed for five weeks before we caught him. Then he escaped from me, despite extensive precautions, and it took us another week to catch him again. Both times, large neon posters were critical to locating him. If you can catch a stray dog right away, posters won’t be necessary. Often, the kind of dog you will be trying to help is one that other people have tried and failed to catch. Each time someone chases and grabs at a dog, it makes it harder to catch him. 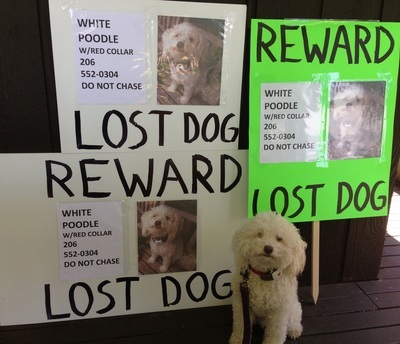 In those cases, a dog may be displaced from an area where he feels comfortable, and you will need large neon posters to get new sightings and locate him again. Your posters should look like the examples in this picture. Because the Seattle area has plenty of wind and rain, you should consider making your posters using corrugated plastic sign boards. They are more expensive, but they last longer, and you can reuse them on multiple stray dog hunts. In the case of Viktor, having a picture of him really helped generate leads. We improved the picture, or at least made easier to distinguish, by erasing the background, making Viktor clearly distinct on the background of all white. This was done using an iPhone app called Pixelmator, although there are plenty of other apps that can do this. Some apps claim to automatically remove the background, but they haven’t worked well for me so far. It took me about twenty minutes to carefully paint the background white for Viktor’s picture. That was twenty minutes well spent because it generated up to twenty sightings a day as we tracked him all over Seattle. If you had a pure white dog, of course you would paint the background some other color than white, possibly bright green or hot pink to attract attention. Mark the back of your car. While I was searching for Viktor, I had a large poster on the back of my car. People would see the sign and point, saying He went that way. It was very handy. You can also write on your window using NEOplex markers. You might also want to create a twitter post about the stray dog. I personally hate Twitter, but millions of people like it. If you are comfortable using Twitter, then that may be a good way for you to get leads or help. The second time we caught Victor, we caught him in a large fishing net. This isn’t a tool you would use very often, but it can be the perfect tool when other methods won’t work. Viktor happened to fall asleep between two buildings, and a fence prevented him from running that direction. Once Dawna and I covered the gap between the buildings with the large net, Viktor couldn’t go anywhere. When he woke up, he ran into the net. Then I dove on him. Viktor peed and pooped all over the place, and also nipped me a little, so be prepared for that if you catch a dog in a net. Also, the net isn’t going to hold a dog forever, so you have to secure him with a leash or a catch pole or something as soon as you can. We have also used the big net to block off an opening, and then put a humane trap under it, so it appears to be the only way out. The dog runs into the humane trap thinking it is an escape route. The net I’ve been using is about 12 feet by 15 feet. 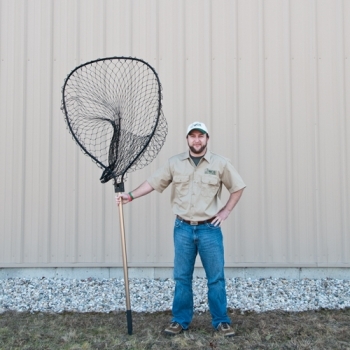 A magnum net is like a fishing net on a pole, held open by a frame. I used this to catch Smilla, and it was a very unorthodox capture when all other methods had failed. If you use this, you will definitely look like a cartoon dogcatcher. Smilla had been partially sedated with Acepromazine. This slowed her reflexes enough that, when she was asleep, I was able to sneak up and then run toward her and pop the net on her before she could run away. There are not many situations where this net would be advisable, but you should know this tool exists. It comes in different sizes, and in one model, the handle is adjustable from 6’ to 12’ long. Chemical capture can refer to drugging a dog’s food, or shooting him with a tranquilizer dart. Either way, it has a low chance of success and high chance of ending badly for the dog. If you shoot a dog with a dart, he is going to run. He could run onto the freeway or into a lake in an impaired state, and be more likely to suffer injury or death. Drugging a dog’s food often doesn’t have much of an effect until you use a dosage that would be considered unsafe by a veterinarian. Tranquilizer darts can only be issued to a licensed veterinarian, and they require a special gun. You might try drugging a dog’s food with acepromazine or valium, as a last resort, but be prepared that it might not work at all or it could hurt the dog. Chemical capture only worked for me once, with Smilla, because it slowed her down a bit. Forward looking infrared, it is also the name of a company that makes this equipment. I have not tried this, but it is something I would like to use if the reliability was improved and the price came down. Reviews I have read of the top of the line FLIR units report that it often does not work as advertised. If it really did work like you see in the movies, detecting people through the walls of houses even, then it would be a very useful tool in trying to capture a dog hiding in the woods. A drone is a remote controlled helicopter with a camera. This may be useful in some instances. The problem with using a drone in the Seattle area is that there are trees everywhere, and the view of the ground is mostly obscured. In eastern Washington, it would probably be much more useful. Ideally, everyone should have a first aid kit in their car that would be useful for people and dogs. Here is a list of things you should have in it. I keep my first aid supplies in a sturdy metal tool box so that Komu can’t break into it. You should also take a course in first aid for dogs. Diphenhydramine (Benadryl®), if approved by a veterinarian for allergic reactions. A veterinarian must tell you the correct dosage for your pet's size. When Viktor nipped me, I was the happiest person in the world because that meant he was caught, safe. In general, though, you should try to avoid bites for at least two reasons. First, they hurt, and they could prevent you from helping a dog. Second, you don’t want a dog to have a bite on his record, if you can avoid it. Ethically, you should always disclose to a foster or adopter that a dog has bitten someone. If a dog bites you during a capture attempt, that does not mean that the dog is vicious or dangerous. If you are paying attention, a dog will give you a warning before he bites. If you are trying to catch a dog, you should be reading his body language anyway, to improve your chances of catching him. As I describe the warning signs below, keep in mind that I see all these signs on a daily basis as my dogs are playing with each other. The warning signs don’t mean a bite is definitely coming, but if you see these signs, take it as a cue to be cautious and start using calming signals. The dog starts whapping his tail against the ground or against a wall. He turns his head to one side and his eyes to the other--whale eye. You hear a low growl. Snapping and growling may be a warning sign, but it may also be a positive sign because the dog is expressing himself this way, and therefore might not need to bite. Still be careful, though. A dog that was relaxed stiffens his body. The tail comes up, curved, stiff, not wagging. Dog behavior is quite variable, and you need to get to know a particular dog before you can really read his behavior. I know of one adorable little dog who will enjoy sitting on your lap and then bite you if you get up to walk away. One of the main ways you can avoid a bite is just to slow down and give the dog time to adjust. I have been bitten by at least 8 dogs, and those bites came during sudden actions when I was grabbing a dog to get him to safety. All of those dogs were reasonably friendly later, and I had no reason to fear them. I like to use a humane trap whenever possible because it is easier on the dog and it reduces the risk of a bite. 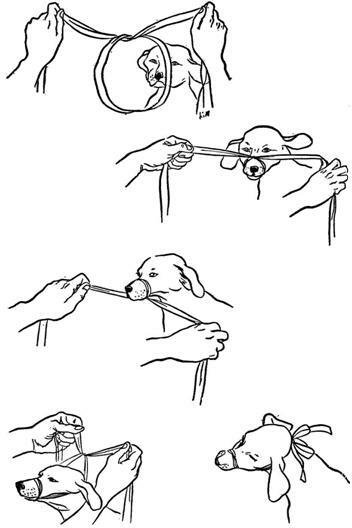 Make a muzzle with a leash. Especially if you come upon a dog that has been hit by a car, you may wish to make a muzzle. This can be done with a leash, a slip lead, gauze for bandages, a belt, and probably many other things. Please refer to the following graphic. Note: you want to wrap it fairly tight. You aren’t going to leave this muzzle on for a long time, just long enough to get to the vet. What to have in your car. This is the complete list of everything I like to have in my car. Of course, you may not have room, and some of these items are a little expensive. Equip your car with a few basics at first, and you can fully gear-up over time. Smartphone. A phone charger is a must. A portable backup battery is also handy. Treats, kept in the glove box or tool box. Also, cans of cheap cat food, with lids that pop off. Many leashes and slip leads. A flashlight and a spare flashlight. Dog waste bags, because I always need them, and because they are also useful for gathering evidence, such as animal remains. ID tag with your number. Moist towelettes to clean my hands, and or sanitizing lotion. NEOplex markers for the rear window. Pet carrier, the folding kind. A portable printer can be very useful sometimes. A tool box with basic tools like screwdrivers, pliers, wrenches. Make a harness with slip leads. 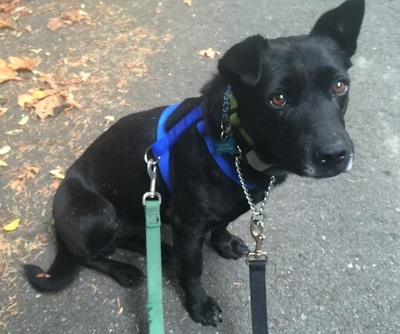 Any dog that is new to you should be handled with two leashes, one on a collar and one on a harness. Since you probably won’t have the harness of the right size handy, you can make a harness with two or three leads or leashes, depending on the length. Please see this video. Choose a simple background. If the dog is in your custody, you can shoot at a slightly downward angle so the background is just lawn or pavement. Try to shoot with the sun or street light behind you if possible. Use treats. Hold the treat near the lens. Don’t thrust your camera out in front of you, into the dog’s face. This is an aggressive gesture, and the opposite of a calming signal. Hold your camera to the side and aim back toward the dog. If you don’t frame it just right, you can crop the picture later. Crop your picture before sending. Most smartphones make this an easy process. You want the dog to fill the frame of the picture, with little background showing. Take many pictures. You can always delete the ones that didn’t turn out. If the dog is running loose still, shoot a bit of video if possible. It can be helpful to have video of the dog’s movements and behavior. Get ID on the dog somehow. Once you have a dog in custody, get some sort of ID on him in case he gets loose again. Ideally, you would attach a dog tag with your phone number. If you don’t have one handy, you can write on a piece of paper, and fix it to the collar by wrapping clear mailing tape around it. You could also write directly on a nylon collar using a sharpie. If you are going to be helping a lot of stray dogs, you may want to invest in a microchip scanner. A universal scanner costs $300. Having a scanner with you can help you reunite a dog very quickly sometimes. If you don’t have a scanner, take the dog to the nearest vet that’s open, and they will usually be happy to scan the dog for you. Be sure to have the dog secured with two leashes, one to a collar, one to a harness, when you take him into the vet. If the microchip information was not kept up to date by the owner, you may have to do some sleuthing to locate them. Perhaps you would only be able to learn where the chip was implanted, but you can call that vet or shelter, and they can probably track down the owner with their information. If you are unable to catch the stray dog in the first day or two, you may wish to have a wildlife camera watch the humane trap or a feeding station, in order to see the dog’s behavior and learn his patterns. The Moultrie A5 is an inexpensive, reliable camera. Place the camera about four feet from the trap or the food. If possible, have it about a foot off the ground. The more comfortable you are with using maps, especially on your smartphone, the easier it will be to communicate with others where the dog has been or where you should meet. Most smartphones will allow you to use a variety of different mapping applications, so experiment until you find the one that works best for you. Keep in mind that there may be multiple ways of accomplishing a mapping task. For example, if you want to tell someone where you are, you can probably open the map app for your phone and choose to share your location from the options available. If you can’t figure that out, you can take a screenshot of the map you are currently viewing, and then send that picture. You can also tap on the location of a house nearest to you, then choose to see more information for that house, and copy the address from that screen. Then you paste the address into a text or email and send it. The key to using mapping apps is to practice with them before you need to use them while searching for a lost dog. Certain apps, such as Glympse, will show someone your current location continuously, so that you can coordinate your movements. A smartphone is a powerful tool for helping lost and stray dogs. They can help you be more efficient and productive while coordinating a search. Here are some of the apps I often use to help with lost dog searches. Google maps, for sharing locations and navigating to a reported sighting. Evernote, to record information and store notes and pictures. You can create a file for each dog you are searching for, in case you need to look up that information later. Dropbox, for storing pictures and files, and sharing them. Facebook. You can often coordinate a search right on a Facebook page, and reach a whole group of people quickly. Glympse, for sharing your location. Texting is often useful for staying in contact with many people at once. If you can use the voice to text function, you can be very fast and efficient. The flashlight app on your phone can be handy to light your way when you don’t have a flashlight. There are many good photography apps besides the one that is native to your phone. Pixelmator is useful for editing pictures, especially removing the background, for clarity. Enlight does a good job of enhancing photos and adding text. Skitch is great for drawing on maps or adding text to a picture. Walgreens and FedEx have apps that will let you print fliers by sending a file to the nearest store and picking it up in as little as an hour. Pages or other document creation apps can allow you to create a flier right on your phone. Whitepages is an app that will tell you the phone number of the people in the houses nearest you, in case you need to call them to ask for permission to go onto their property to look for a dog. Once in your custody, any found dog should be secured with two leashes, one to a harness, one to a collar. I will usually make a stop at a pet store and buy a harness. To do this, I wrap a leash around the dog’s chest and mark the circumference of his chest with my finger. Then I leave the dog in the car while I go in the store to buy a harness the right size. You can have a tag engraved as long as you are there. 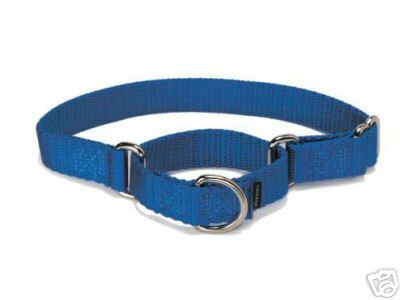 When buying a collar, try to always get a Martingale or no-slip collar. Transport in a kennel when possible. For the safety of the dog, especially if you were to get into an accident, it’s best to transport dogs inside kennels or carriers. You can get a collapsible kennel that won’t take up much room in your car, and you can fold it out when needed. If I catch a dog in a humane trap, I will usually just transport the dog inside the trap. When you get to your destination, carry the whole trap inside the house or building before opening it. One word of caution about loading a humane trap into your car while a dog is inside: be sure to lift it in, not slide it. A dog’s toes can extend through the wire mesh on the bottom of the trap, and then be pinched and injured when you slide it. Lifting the trap to move it will avoid this risk. If you have caught a dog that is a high risk for escaping again, you may wish to attach a GPS tracking unit to his collar. This would probably need to be ordered online, so that’s not very convenient. Hopefully, in the near future, GPS trackers will be offered in local pet stores.